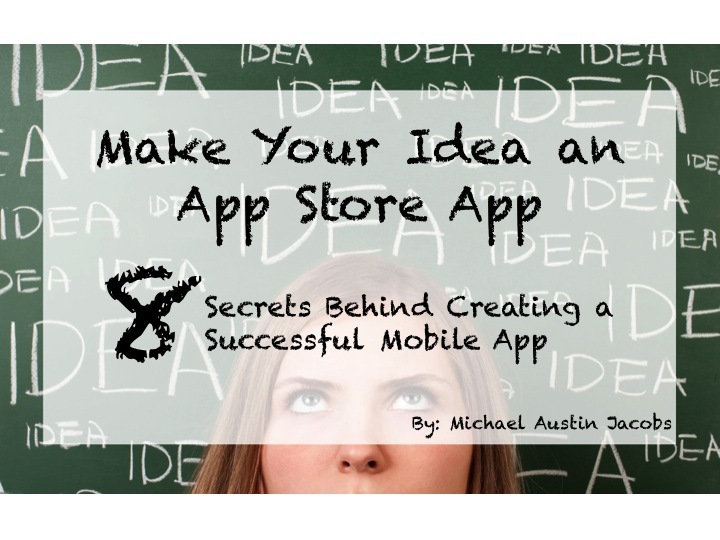 Description..."Make Your Idea an App Store App: 8 Secrets Behind Creating a Successful Mobile App,” is a new eBook that shares the secrets for any entrepreneur to think up a great app idea, capitalize on the opportunity, and publish their app on the App Store. Author Michael Austin Jacobs, Co-Founder and CEO of SociaLink App, shares some of his insights on the complications and failures he faced in his development journey. He talks about how to come up with a successful idea for the App Store, how to correctly choose and manage your development team, how to publish to the App Store, and more. Michael and guest writer Aaron Whitfield, CEO and Founder of PocketFullOfApps, conclude by telling you how to correctly pitch your app to editors and writers at major sites like TechCrunch, Mashable, and 148Apps.